Prothane's rear sway bar bushings are made with polyurethane and maintain their shape, and grip, much longer than rubber. Polyurethane Rear Sway Bar Bushings from Prothane are an aftermarket alternative that will reduce body roll and improve handling over the original rubber bushings. Find your Rear Sway Bar Bushings below. If you have a RWD vehicle then the traction of those rear wheels is important, and the rear sway bar helps keep the contact patch on the pavement when you turn. The only problem is that the rubber bushings that hold the bar in place are prone to wear out and lose their grip on the bar. When this happens the bar is allowed to shift and lose some of it's ability to reduce body roll and keep the inside wheel down during a turn. Prothane's rear sway bar bushings are made with polyurethane and maintain their shape, and grip, much longer than rubber. Prothane's bushings hold the rear sway bar in place and handle years of turning without hollowing out, whether it's a daily commute or laps on a track. Upgrading to these sway bar bushings will actually improve your handling as if you had installed a larger diameter sway bar, for a much smaller price. These bushings also endure elements like road salts, grime, and weather that cause rubber to deteriorate. 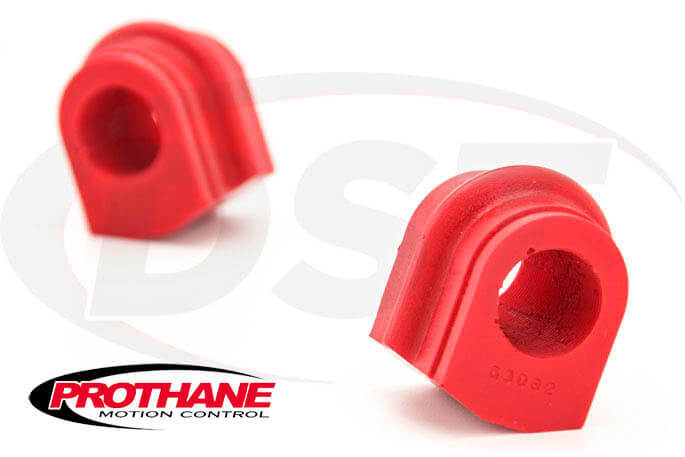 Check out Prothane's solution to weak original sway bar bushings. Backed by a Lifetime Warranty and Made in the USA. * If you have trouble finding the right size for your sway bar you can contact our customer service folks or check out Prothane's Universal Sway Bar Bushings for an exact measurement.